Well known as a high ranker in “The Top 10 EDM Music Festivals In The World”, Creamfields is the jewel of the UK’s live music events. Entertaining a crowd of thousands since 2003, Creamfields has recently been granted a 4 day license to run performers on 25-28 of August 2016. 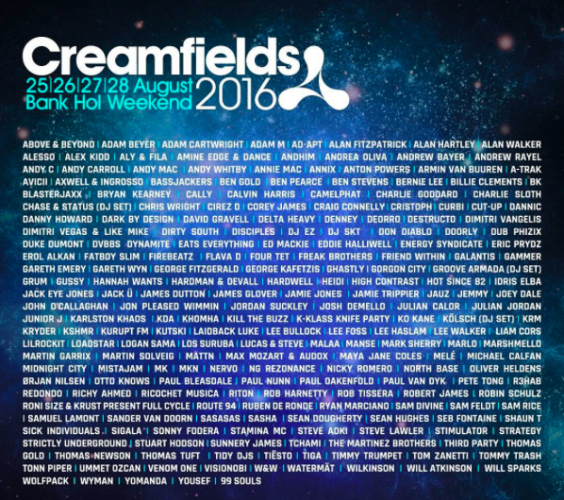 UK’s, now biggest EDM festival, Creamfields is guaranteed to tick a myriad of performers off of our “To-See” lists. Throughout the course of UK’s bank holiday weekend, the likes of Tiesto, DVBBS, Jack U, Steve Aoki, and Avicii will be lighting up the stages from morning till night. This all star lineup features, what seems to be, all of the EDM’s industries biggest names - but here are our top must-sees. Although his name may not seem familiar to most, Eddie Halliwell has produced some familiar hits. In part with Fire It Up Recordings, Halliwell has been on the stage as early as 2002. Sharing the stage with DJ peers such as Sander Van Doorn, Thomas Gold, and Kryder. As well as, has received huge support from big names like Deadmau5 and Swedish House Mafia. Returning to Creamfields for 2016, Eddie Halliwell is quite renowned for his performance energy. Extremely innovative when it comes to technology, he is constantly manipulating his music and lighting. When it comes to a complete performance Eddie Halliwell is sure to be the main buzz of the day, providing for an amazing start to the weekend. Building his passion for music on solid ground by working tirelessly behind the scenes, Sam Feldt has truly made a name for himself in the house music world. Picking up a load of steam after his hit “Show Me Love”, Sam Feldt is an exciting addition to the Creamfields roster. This Dutchman’s zeal for music shines through every hit of his. Traveling the world with his sound, he cultivates beautiful melodies into grooves you can really get into. Sam Feldt’s contagious energy will uplift Creamfields Friday sets to the place where they belong. We are no strangers to the name. Avicii is an award winning artist that will go down in history. For 5 years, Avicii has been working, performing, and creating tirelessly in the EDM world. Producing breakthrough after breakthrough, at only 26 years old he can look back knowing he is now a household name. On 19 March, Avicii announced the shocking news of his departure from live performances come the conclusion of 2016. It’s now or never to experience this EDM legend. Saturday at Creamfields will surely be one to remembered - One look back on and say with pride, “I was there!”. Seeing Calvin Harris live has since become a special experience to be had. With Calvin Harris having sets exclusively in Vegas, and on the roster for top music festivals, he is one of the crown jewels for Creamfields. With his fourth album “Motion”, still bursting with success even with being released in late 2014, Calvin Harris still holds top spots for single “How Deep Is Your Love” ft Disciples. With Sunday bringing Creamfields 2016 to a close, Calvin Harris will be sure to bring it out with a bang. As Creamfields in Daresbury, UK runs rain or shine, (usually rain), this 4 day weekend will be the perfect excuse to break your rain boots out to get ready for a legendary experience.